Maximum Power Point Tracking solar charge controllers or MPPT charge controllers are relatively new to the solar energy industry. These charge controllers are different than the traditional charge controllers in that they are more efficient and in many cases more feature rich. 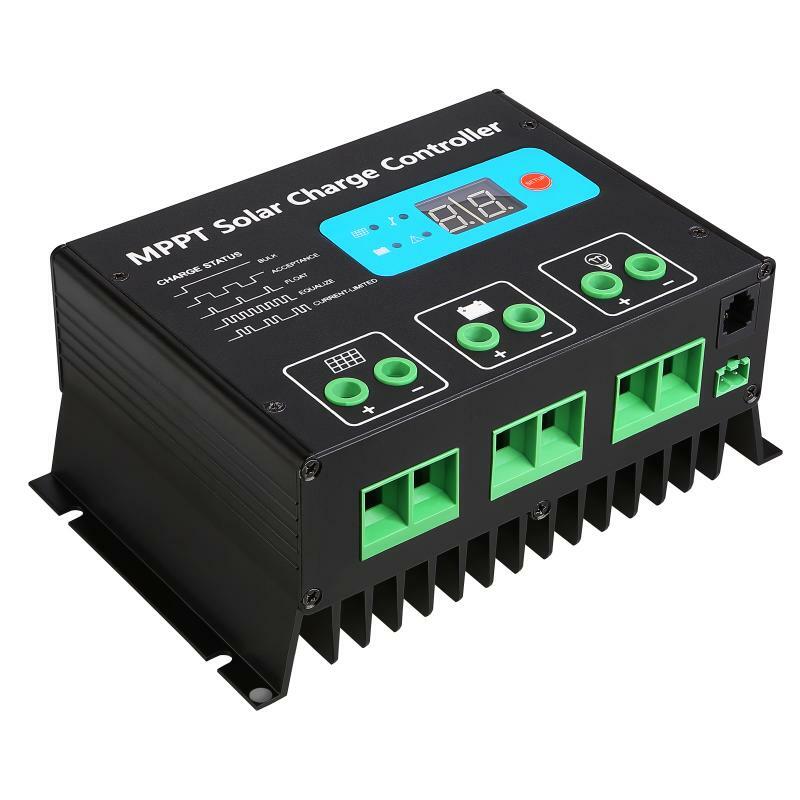 MPPT charge controllers allow your solar panels to operate at their optimum power output voltage, improving their performance by as much as 30%. Traditional charge controllers reduce the efficiency of one part of your system in order to make it work with another. 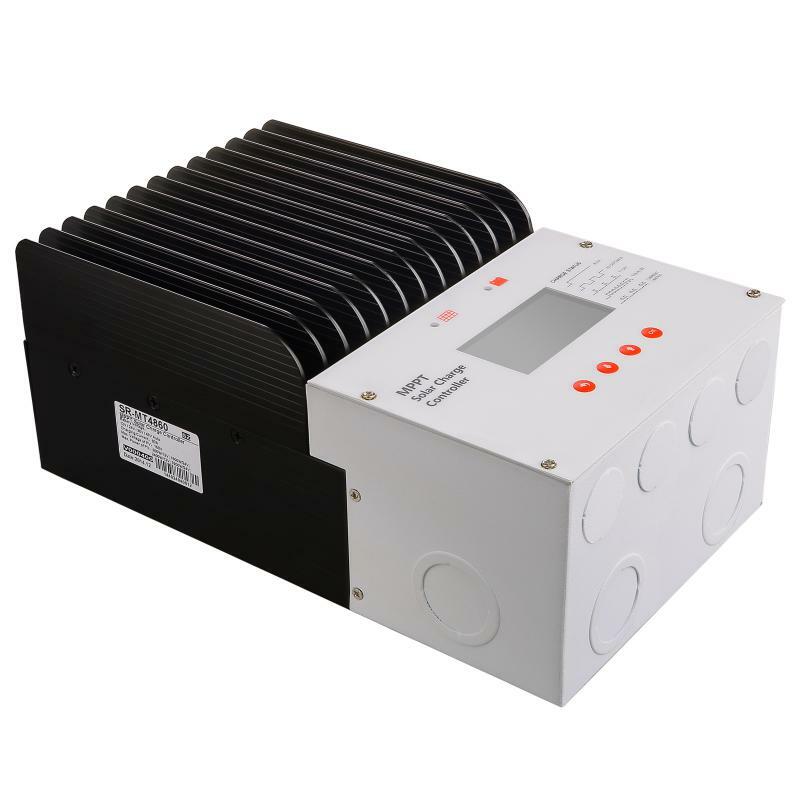 Several MPPT charge controllers can accept high input voltages (up to 120V+ DC) from your solar array and efficiently down convert the DC voltage to that of your system (e.g. 12, 24, 48VDC, etc) which means you aren't losing any generated power and you are able to use what you generate more efficiently. Additionally, using a much higher DC voltage on the input side allows you to use thinner wire, decreasing your wire cost and making installation easier. 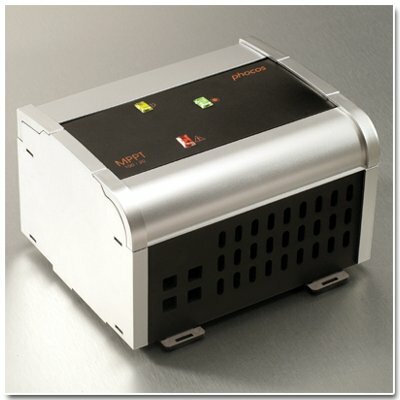 We carry all of the best brands of MPPT charge controllers. Although MPPT is more expensive, but the return on your investment will come that much more quickly as your system performance will be significantly improved. Choosing a well made charge controller is integral to the long life and efficiency of your entire solar power system. By optimizing the power coming in from your solar panels, you'll get that much closer to offsetting your use of traditional on grid power sources and by protecting your battery supply you protect yourself from any unwanted and unneeded replacement costs. Your solar charge controller is an item well worth investing in and researching as your customize your solar panel electric system. Make sure you choose an option that is scalable and appropriate for your power load and make sure that you have sufficient battery storage space for the solar panels you've chosen to install. Use our resources at solarpower-mart.com to construct the right solar power electric system for your home or alternate location. We'll advise you on everything from optimizing your current power load to how best to install your solar panels and on choosing the right solar charge controller! The Sigma 2.0 MPPT controller with Maximum Power Point Tracking (MPPT) technology is used in off-grid solar system. Adopting advanced tracking algorithm, it can get the maximum power point of solar module to improve the efficiency of whole system. The controller optimize the controlling within battery charging to extend battery life. Self diagnostics and electronic protection can avoid mistakes within installation. SIgma 2.0 MPPT charge controller is different than the traditional charge controllers in that they are more efficient and in many cases more feature rich. Sigma 2.0 MPPT charge controller allow your solar panels to operate at their optimum power output voltage, improving their performance by as much as 30%. Traditional charge controllers reduce the efficiency of one part of your system in order to make it work with another. How Do Sigma 2.0 MPPT Controllers Increase Charge Current? Sigma 2.0 MPPT controller increase charge current by operating the PV module in a manner that allows the module to produce all the power it is capable of a conventional charge controller simply connects the module to the battery when the battery is discharged. When the 75W module in this example is connected directly to a battery charging at 12 volts its power production is artificially limited to about 53 watts. This wastes a whopping 22 watts or nearly 30% of the available power! Patented MPPT technology used in Sigma 2.0 MPPT controller operates in a very different fashion. The Sigma MPPT controller continually calculates the module’s maximum power voltage, in this case 17 volts. It then operates the module at its maximum power voltage to extract maximum power. The higher power extracted from the module is then provided to the battery in the form of increased charge current. In conditions where extra PV power is not available, Sigma 2.0 MPPT controller will operate as a conventional controller with very low voltage drop. The actual charge current increase you will see varies primarily with module temperature and battery voltage. In comfortable temperatures, current increase typically varies between 10 to 25%, with 30% or more easily achieved with a discharged battery and cooler temperatures. What you can be sure of is that Sigma MPPT charge controller will deliver the highest charge current possible for a given set of operating conditions. Can be used in all kinds of bad environment with Aluminum frame. Double crest or multi crest tracing technique design, when the solar panel is under shadow or part of the solar panel is damaged, multi crest will turn up in I-V curve, and the controller can still trace the Max. Power Point. Built-in maximum power point tracking algorithm which could promote energy utilization efficiency of pv system. The charging efficiency is 15%~20% higher than PWM mode. Four stage charging order mode: MPPT-equalizing charging-boost charging-float charging. With current-limiting charging mode, when the power of solar panel is over-sized and charging current exceeds the rated current, the controller will lower the charging power, which enables the system to work under the rated charging current. It can communicate with PC by communication wires and cables, read or set controller’s running parameters and monitor the system operation status. The controller can realize networking operation by the link with telecommunication cable. Support data storage, the storage span can reach 5 years. 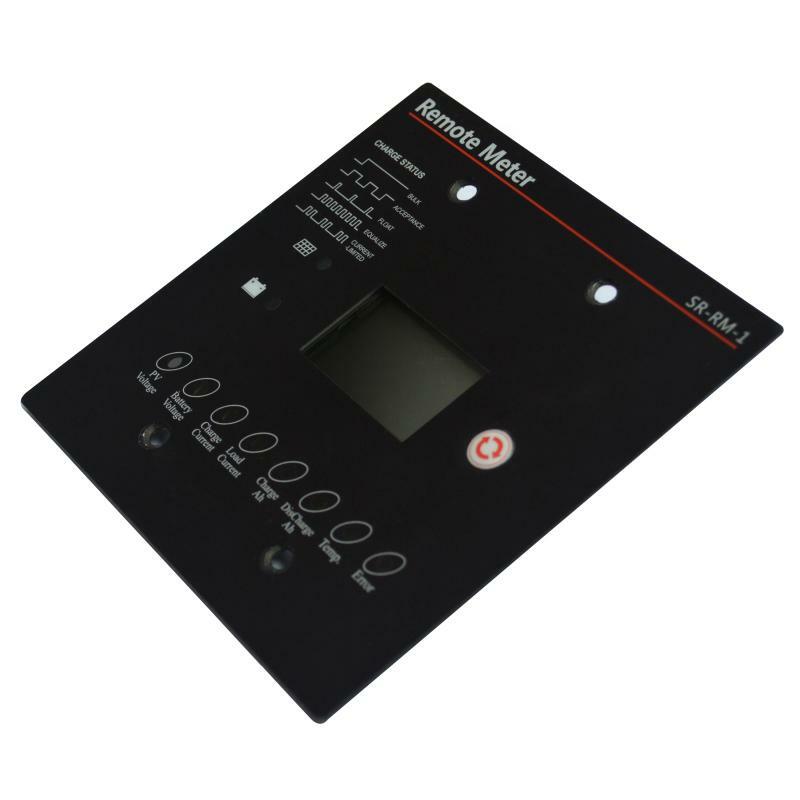 It can connect with LCD screen monitoring and the controller parameters are amendable. Built-in temperature sensor, when the temperature exceeds the set value, the charging current will lower down followed by the decrease of temperature, so as to control the controller’s temperature rise. With temperature compensation function to adjust the charge and discharge parameters automatically, which can improve battery service life. Various system protection functions. Including over-charge, over-discharge, over-load, over-heat, the battery reverses connection protection and so on. With innovative maximum-power-tracking technology, Phocos' MPP-Tracker ensures maximum performance from your solar array at all times and in all weather conditions. The MPPT can yield an energy gain of up to 30% from your PV array (with the average gain being 10%-25%). The temperature-compensated three-stage I-U curve charge regulation alogarithm significantly extends the lifespan of your battery. The possibility to use less expensive grid-feed-in solar-panels with up to 95V open circuit voltage for 12V. 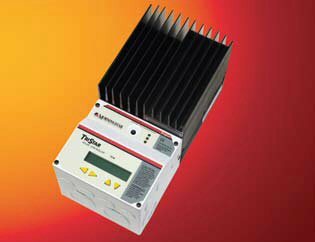 Morningstar TriStar MPPT solar controller with TrakStar Technology™ is an advanced maximum power point tracking (MPPT) battery charger for off-grid photovoltaic (PV) systems up to 3kW. The controller provides the industry’s highest peak efficiency of 99% and significantly less power loss compared to other MPPT controllers. The TriStar TS MPPT 45 features a smart tracking algorithm that maximizes the energy harvest from the PV by rapidly finding the solar array peak power point with extremely fast sweeping of the entire I-V curve. Five Year Warranty, see Product Documentation section above for details.